Almost every gardener faces the challenge of a low-light area. Few plants tolerate shade, and even fewer will produce blooms without full sun. Luckily, several annuals love the shade and will happily brighten the darkness with colorful flower displays. Before choosing shade-loving annuals, assess your light levels. Shade levels categorize into low, medium and full shade depending on the number of hours of sunlight received each day. Impatiens (Impatiens wallerana) readily grow in any shade level. Their adaptability make them one of the most popular plants for low-light areas. Beautiful blooms come in almost every color imaginable. These vigorous growers spread rapidly, making them ideal for containers or under trees. Plants stay small in height, growing to only 2 feet tall. 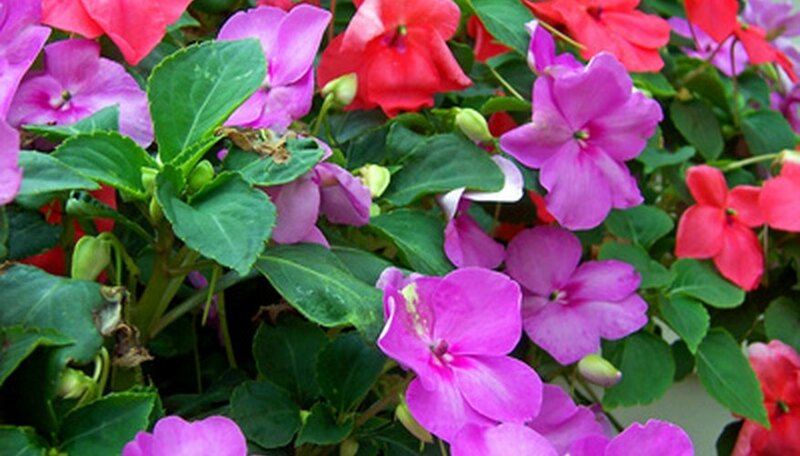 Keep impatiens warm and moist to achieve the best results. For something a bit more unique, plant wishbone flower (Torenia fournieri). From a distance, these blooms resemble snapdragons. Flowers come in purple and white or pink and white varieties, some contrasted with dark speckles on the petals. Plants withstand low to medium shade and readily produce blooms during cooler parts of the growing season. Wishbone flower remains smaller in size with a height of 1 foot. Lobelia (Lobelia erinus) lends a sense of patriotism to gardening spaces with cultivars available in red, white and blue. A dwarf when compared to other annuals, plants only grow to 6 inches tall. These spreading plants need cool temperatures and moist soil to produce blooms. Plant lobelia in beds or hanging baskets and place in low to medium shade. Wax begonia (Begonia semperflorens) remains a common annual sustaining even full shade. Succulent foliage comes in green or bronze with white, pink or red flowers depending on the cultivar. Extremely durable, blooms will repeat throughout the growing season regardless of soil or light conditions. Plants vary in size by cultivar, reaching heights of 6 to 24 inches high. A beautiful option for shady patios, fuchsia (Fuchsia x hybrida) does exceptionally well in containers or hanging baskets. Protect plants from the afternoon sun and dry soil, or flowers will fade and drop. These beautiful red, white, pink or purple bloomers will reach a height of up to 2 feet depending on the cultivar. Fuchsia grows most often as an annual but can be overwintered successfully if cut back and stored indoors in a cool, dark space.